This combination dowsing tool was developed by Verne Cameron in California in the middle of the last century. 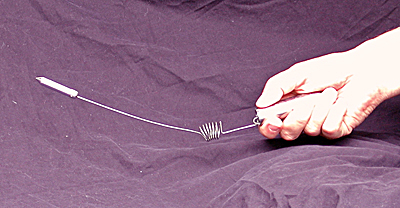 It is essentially a spring loaded L rod, but it has many different uses and can act as a number of different dowsing tools. The Cameron Aurameter in the usual Search position. Note the tip is pointing slightly up. As its name suggests, it was initially designed to look at human auras, and to find holes in them. (For example, we humans usually have a hole in the small of our backs.) This tool is not very good at looking for a specific point as in Drill here but rather, it is excellent at defining outer perimeters of energy fields, or for following underground veins of primary water, or other less than straight energetic phenomena. Now here's the most important tip I can give you: When following the path of a vein or any other energetic sructure, push against the edge of it. it is "sticking" on the Glastonbury Tor. This map is by Palden Jenkins. Do not allow the aurameter to get into the L rod search position because when it does that, >it is very easy to loosecontact with the vein or energy line. Push against the vein. Keep the wire bent. Let the tip lead you like a dog on a leash. 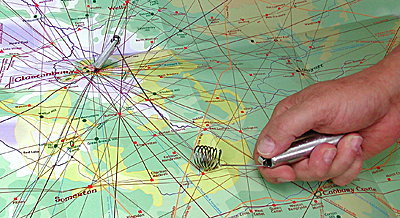 For map dowsing, bend the tip down "like a sniffing dog" and it will lead you just as if you were on site. /*Map Dowsing the Glastonbury Ley Map. Notice how the tip of the Aurameter has been turned to point down and it is "sticking" on the Glastonbury Tor. 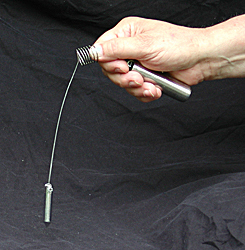 The Aurameter, unlike any other dowsing tool that I am familiar with, can do two dowsing operations at once. While following a vein, for example, you can ask a question like, "Is this vein more that twenty feet down?" The tip will still follow the vein, but, like a wand or bobber, it will bob up and down for "Yes" or go side-to-side for "No." This is the only dowsing tool I know of that can do this. So it can follow something (by pushing against it and moving forward), but at the same time, you can be asking yes or no questions about the thing you are following, or something else, by using the tip as a bobber or wand. You can also turn the handle 180 degrees, stick your thumb in the coil, and use the tip like a pendulum. I use it this way quite frequently. In closing, I need to say that this tool is rather expensive, and most dowsers do not need one. However, if you frequently need to follow things ? like veins of water or other energies, it is much less stressful on your arms and wrists than other tools. Also, it is the best there is for helping others to see the curving energies that you are finding. And, of course, it is great for looking at auras! You can purchase a Cameron Aurameter at the Tools Section of BSD Supply. It is my favourite tool for work in the field when exploring sacred space, and judging by the "Which dowsing tool is most commonly used" poll in the British Society of Dowsers (BSD) Form, a growing number of other BSD dowsers would agree. Now that you know how to use dowsing tools, your ready to look into how geomancers use this ancient tool. For further dowsing instruction, check out our Geomantic Events page, the American Society of Dowsers, and the British Society of Dowsers.